With no particular planning, we now have an array of three stringed instruments hanging in the living room. It started with me. I took a few guitar lessons two Springs ago. Then “real life” intervened, as it so often does. I got busy with the house hunting, then the house buying, then the renovations, then milking the last bit of Summer, then school started in the Fall, then… Anyway, the guitar sat idle for a while, until last month when I picked it up and started fooling with it again. I soon decided I’d play a lot more if the guitar was out and on display, easy to get to, easy to remember. And so I decided to hang it on the wall in the living room. Why not; it’s not unattractive to look at. Two Summers ago, Michelle saw a cigar box guitar at the Oregon Country Fair and was pretty immediately smitten by them. She’s never played a guitar of any sort before, but she was captivated and seemed to really want one of her own. I decided to buy her one as a Christmas present this year, and it went up on the wall next. Last year at Burning Man, mags camped with the very musical Acaplaya camp, and several of her fellow campers had guitars and ukuleles. She expressed interest in participating in a ukulele performance at next year’s Burn, and so a pair of her closest campmates bought her a ukulele. Now it hangs on the wall as well. 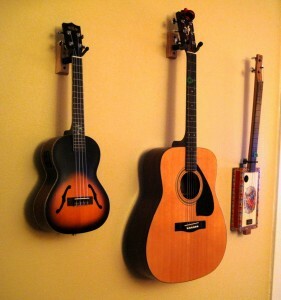 It’s been nice, our little family of instruments on the wall. Homey, in the best sense of the word. And yes, it has definitely meant we get them down and play them more often, almost nightly. My calluses are coming in nicely, thank you very much. I was pretty happy with myself over that one.